[miau] One of the best things about any type of online game is that the themes can vary wildly and pretty much cover any conceivable topic. For instance, you can find games dealing with dragons, casino robberies, ancient Egyptians, and even robots. 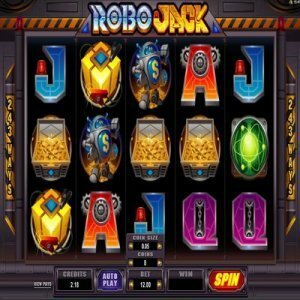 Robojack is a relatively new slot machine out of the Microgaming stable, and this robot-themed game is quickly turning heads. It is a graphically intense game that offers a range of different bonus features and free spins to keep people interested, and it also pays out very often, which is always good news for slots players. The robotic theme of Robojack is a little hit or miss. Sure, the robot theme is cool to have, but Microgaming’s venture seems to have not delved deep enough into the genre to really call it a robot-based slot machine. In other words, some of the symbols, graphics and sounds help to carry the robotic theme, and the graphics are great, but that’s about as far as things go in the realm of robots. It would be really cool to have some cut scenes dealing with robot wars or something. Besides that, the gameplay of Robojack is right up any slot player’s alley. This 5-reel machine is one of many in Microgaming’s all-ways-win catalog, which means instead of the 20-some classic paylines you find with most machines, this machine actually has a combination of 243 paylines. You cannot place bets on them all, but it does ensure that your winning percentage will go up a few points when you play Robojack. Most of the wins are going to be small, but they’re still wins. In terms of bonus features, you can find some free spins with Robojack. When you hit three or more scatter symbols, you will unlock free spins with the chance to retrigger them in the future. There are also multiple bonus games that can be triggered. These aren’t necessarily separate games, but it does take you to a separate round of spins. Once there, you will get to earn even more wild reels and multipliers. As touched on briefly above, this is an all-ways-win 243-line machine, so you cannot custom-tailor your betting structure on any number of lines. For many slots players, this isn’t that big a deal, however, as they don’t spin for a lot anyway. The betting range is fairly wide, allowing you to play for low or upper-mid-level stakes. There’s also an autoplay feature, just in case you feel like cruising on autopilot for a while. While the graphics are good and the machine does manage to pay off well, it could definitely use a few theme upgrades. The robot theme just doesn’t come through like it could with a little work. Other than that, though, Robojack is a solid addition to the Microgaming lineup that many low to mid-level slots players would probably adore.